Singer, an ardent supporter of mass illegal and legal immigration, has opposed Trump’s pro-American immigration platform and claimed in 2016 that Trump’s economic nationalist agenda would “guarantee” a “widespread global depression,” though no such theory has panned out. Likewise, Stephens attempted to stop Trump’s nomination for the Republican Party in 2016 by throwing at least $5.9 million behind attack ads and super PACs that opposed the president’s economic nationalist agenda. Also keeping access to the White House despite his opposition to Trump is millionaire donor Art Pope, according to Politico, who is a close ally of the anti-Trump, pro-mass immigration billionaire Koch brothers. According to Pope, he has been to the White House five times since Trump’s election and told Politico that although he opposed Trump in the 2016 election and key components of the president’s “America First” agenda, he has been welcomed by the administration. Pope said he’d been impressed by the outreach he’d received from the White House. It has led him to discount the idea that Trump has a blacklist of people who opposed him. Pope was just one of the plutocrat donors who attended a recent gathering with Pence in Pebble Beach, California. 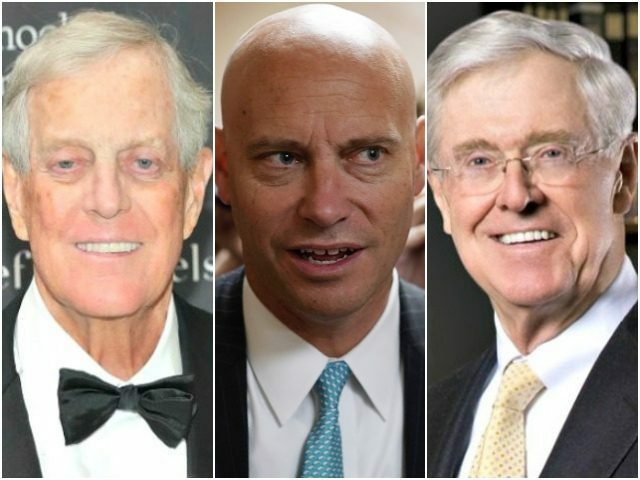 Pence’s new Chief of Staff Marc Short — a former Never Trump ally and Koch brothers executive — organized the donor class meeting. The access to the White House that anti-Trump billionaire and millionaire donors have enjoyed is the latest case in which opponents of the president’s populist-nationalist initiatives have been invited to discuss policy and legislation. Executives representing the Koch brothers and their economic libertarian, open markets and open borders worldview have been invited to the White House this year to discuss national legal immigration policy, as Breitbart News has reported. The Kochs oppose any reductions to legal immigration that would boost the wages of American workers. The U.S. Chamber of Commerce, the Hispanic Chamber of Commerce, the Association of Builders and Contractors, and the Koch brothers’ Koch Industries have opposed any cuts to legal immigration levels to boost Americans’ wages and prefer expanding employment visas so businesses have easy access to cheaper, foreign labor. The Association of Builders and Contractors, for instance, has supported making it easier for foreign nationals to obtain green cards in the U.S., along with advocating for market-based visas where foreign workers would be allowed to take U.S. jobs so long as American industry claims there are no Americans available to fill working and middle-class jobs. Advocacy groups like the George W. Bush Center, the Koch-funded Americans for Prosperity and the Libre Initiative, LULAC, and the Texas Public Policy Foundation likewise have backed policy initiatives to make it easier for employers to outsource U.S. jobs to foreign workers, amnesty for illegal aliens, and an expansion of already historically high legal immigration levels. The George W. Bush Center recently promoted plans that would allow businesses to import foreign workers as they wish, bypassing America’s working and middle-class workforce and depleting growing blue-collar U.S. wages. During Trump’s time in office, the administration’s legislative accomplishments have aligned with policies supported by the GOP donor class, like tax cuts and deregulation. Meanwhile, full funds for a border wall to stop illegal immigration, a plant to reduce legal immigration levels, and efforts to prevent businesses from hiring illegal aliens over American citizens have yet to come to fruition.